This review is based on the collective notes from a Baltimore American Whiskey Club (BAWC) tasting conducted on Dec. 6th, 2014. Attending members were Josh Sullivan, PJ Sullivan, Owen Lang, Justin Custer, Devin Byrnes & Steven Silberg. Written by Justin Custer. 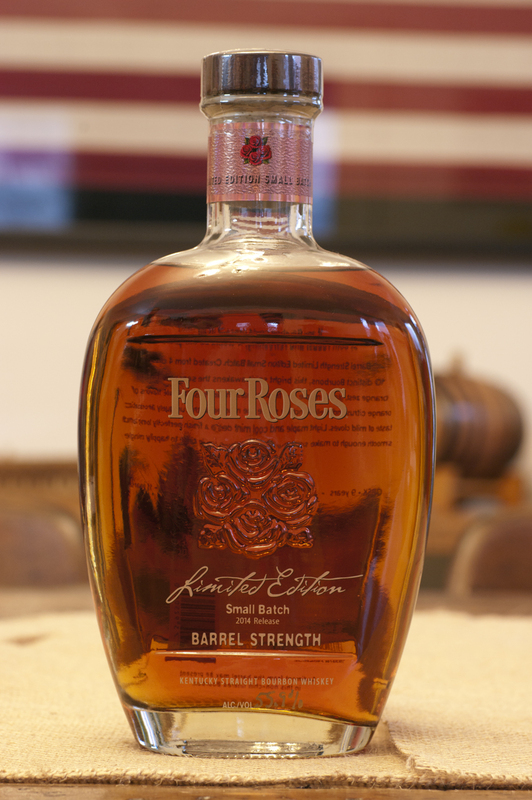 This is a bottled-blend of four of the Four Roses bourbon recipes including a 13-year-old, a 12-year-old, an 11-year-old, and a 9-year-old. The different recipes include a mix of 60% corn, 35% rye, 5% malted barley to 75% corn, 20% rye, 5% barley; and four different yeast strains. It seems the distillery may be replicating practices from the old country by blending these different whiskeys in an attempt to achieve a whiskey greater than the sum of its parts. What they got was a very drinkable and truly unoffensive result, which makes me believe that they may have just come up with one of the most balanced whiskeys BAWC has come across. While nothing in particular stood out, nothing felt missed as it left us to ponder: what did we just taste? Nose: Several of us got pictures of opening up a wax pack of baseball cards while laying stomach-down in a wet barn as notes of paper, hay, and stale chewing gum were tossed around the room. Lesser notes of spearmint and fresh fruits were noticed upon further investigation. Overall, mellow and inviting. Palate: Fruit-on-the-bottom yogurt, particularly that of ripe cherries, with a light sweetness with toasted almonds and tobacco. A warming, well-balance of sweetness, spiciness, toffee, and herbal with nothing in particular standing too far out. Finish: Long and smooth like a fine cigar. Conclusion: Better than OK, but not the best due mostly to lack of personality; however, one should expect this whiskey to open itself up upon future meetings. There is a hidden complexity to this whiskey that one should be careful judging too quickly, or they may miss the point. This is an OUTSTANDING review. I’m looking forward to seeing more reviews and comparisons. Great job. Tell us more about BAWC. Pete Sr.! We need to get you up to Baltimore for an event. This is a very well presented and written review. 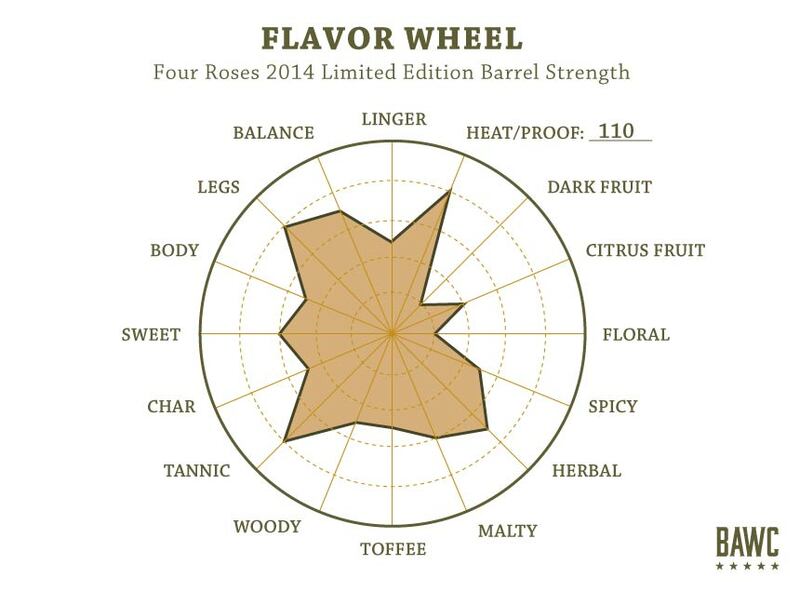 The Flavor Wheel is an effective way to capture the unique characteristics of the sample tasted. I look forward to your future reviews. Thanks, Joseph! I am glad you enjoyed it. We now have two more whiskey reviews up you may enjoy. Thanks again! Thoughtful review without all the usual hyperbole. I wonder if this is not a good whiskey to pair with a meal? The reserve character you describe might well be the perfect companion to Game. How do you join the BAWC? This whiskey would absolutely be perfect for a gamey meat like venison or rabbit. Great call! Want to be a guest at a BAWC tasting? Find us on Facebook and send a message!